← Sweet Tooth is Back! All new Twisted Metal! Duck Hunt is back! And it’s on your iphone. There seems to be a lot of ongoing discussion, lately, regarding the validity of gaming on mobile devices. The simplicity, interface, short game play, and scores of terrible game-turned-apps, out there further perpetuate the thought from console and PC gamers that this new ‘platform’ is less respected than its competition. This topic, which I am still largely on the fence about, has some great points on either side but every once and a while something comes along to offer a new perspective. 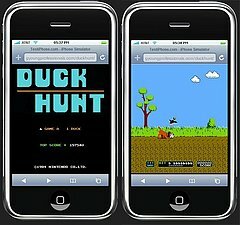 For me this new perspective came when I hesitantly downloaded Duck Hunt for my iphone. With a bank full of Duck Hunt memories in tow, I opened up the game and was pleased with what I saw. In 1985 I stood in my living room, armed with my zapper, shooting all manner of flying ducks and clay pigeons, and revisiting the retro classic on my iphone seemed contradictory but much to my surprise was as satisfying as ever. The graphics are spot on what you will recall from the original NES version, which (for those of you who don’t remember) was one of the two bundle games that came with the system purchase, and includes all the sounds that you enjoyed a mere 25 years ago. After you download this game to your iphone or ipod touch, you will notice one glaring difference with this port… no zapper! Instead the controls of the touch screen are right and left thumb based. The left thumb will be used to navigate your crosshairs and the right to fire your deadly weaponry. The only levels available to you are the one and two duck challenges, but that will be enough to satisfy your retro needs. The gun still fires, the dog still laughs and the ducks still fly ferociously away after 3 misfires, but you wouldn’t miss now would you? Visit the app store and pick up Original Duck Hunt By Triceratops Games for the best $0.99 you will spend today and do so with haste! For a moment let us consider the validity of the NES games of yesteryear. Do we negate the games that got us playing and dub them casual, simple and easy or can a resurgence of NES games bring the iphone, ipod, and other mobile devices to a level of respectability with all gamers?